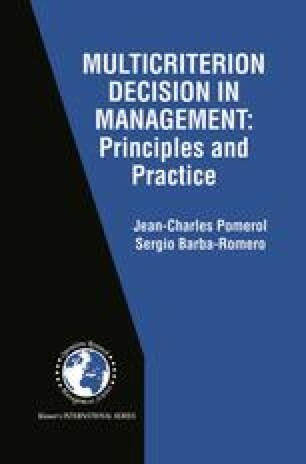 What is Multicriterion Decision Making? In both everyday life and in organizations we are very often confronted with difficult choices where we are unable to decide between a number of imperatives. Here are a few examples of this kind of situation. Suppose there are available p different models N1, N2, … NP of a product N; everybody wants to buy model Ni which is the cheapest, looks best, is easiest to look after and is the most robust (the list is non-exhaustive). These various features are all purchasing criteria. Consider for example price and strength; experience tells us that the cheapest product is not the strongest: price and strength are two conflicting criteria. If we use price as a criterion for choice we may end up buying a product which is not among the strongest. On the other hand, if we buy the strongest product we may also be buying the most expensive. As the saying goes, you can’t have your cake and eat it, and it is obvious that conflicting desires will always lead to a compromise. This is the type of situation we shall be interested in. As B. Roy points out in his preface to Vincke (1989), the term ‘multicriterion decision’ is not a very good one since, strictly speaking, decisions are neither monocriterion nor multicriterion, but are a choice, often an action and almost always an intention — in other words, a host of things which cannot be qualified as mono or multi criterion. What really is multicriterion is the decision support model, which is why a better name would be ‘multicriterion modeling of choice’, or else the term advocated by Roy and adopted by Vincke (1989): ‘multicriterion decision aid’. The reader must forgive us for retaining the terms ‘multicriterion decision’ and ‘multicriterion analysis’ to denote the multicriterion modeling of choice and/or decision situations. Note finally that in this book, the terms ‘monocriterion’ and ‘multicriterion’ will be used as adjectives.